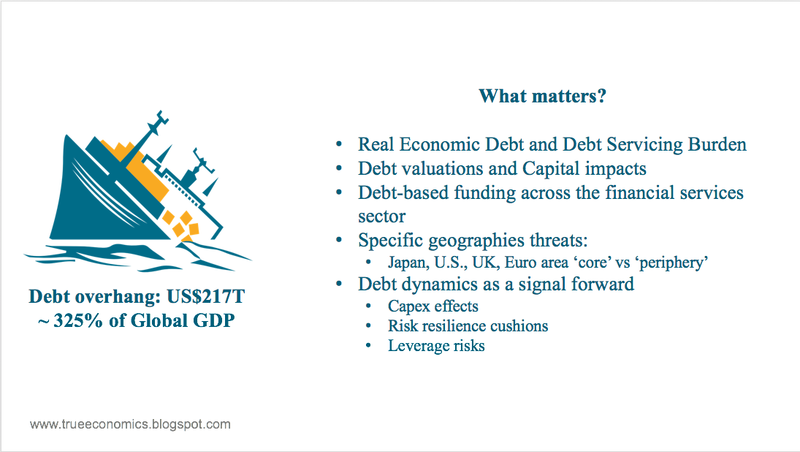 Key drivers: Greece, Italy and France. 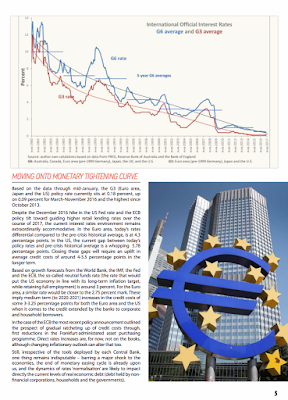 A quick update on Eurocoin, the lead indicator for economic growth in the Euro area. 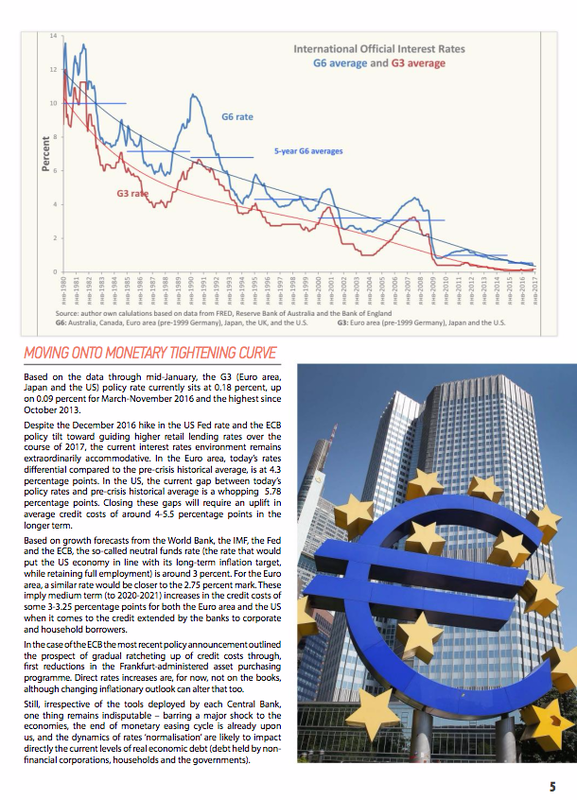 In February, Eurocoin rose from 0.68 in January to 0.75 - hitting the highest level in 83 months and marking 10th consecutive monthly rise. The index has been now in a statistically positive growth territory every month since March 2015. Implied 1Q 2017 GDP growth, as signalled by Eurocoin indicator is now at around 0.7 percent, which, if confirmed, will be the fastest pace of economic expansion since 1Q 2011. The above chart shows that there is now a mounting pressure on the ECB to taper off its QE programme. An interesting insight via https://www.bloomberg.com/politics/articles/2017-02-21/threat-of-cyber-attack-is-biggest-fear-for-businesses-survey on the rising importance of the cyber-security risks and changing business perceptions of the risk. 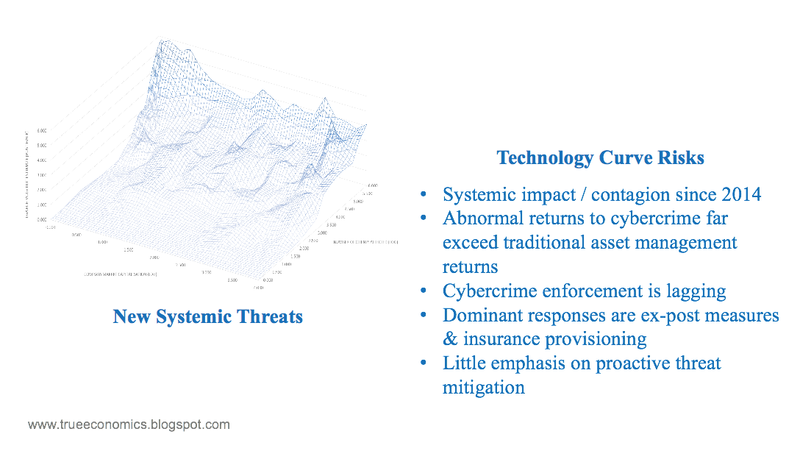 Goes handily with our findings here: http://trueeconomics.blogspot.com/2017/01/23117-regulating-for-cybercrime-hacking.html. 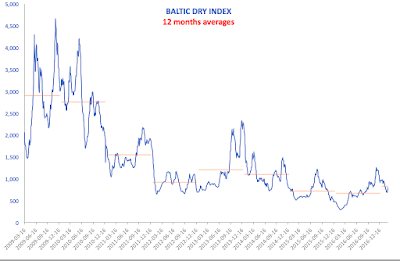 All of the discussions about the Baltic Dry Index - a proxy for global trade flows - in recent weeks was centred on the alleged recovery in the index valuations from the historical lows of 1Q 2016. 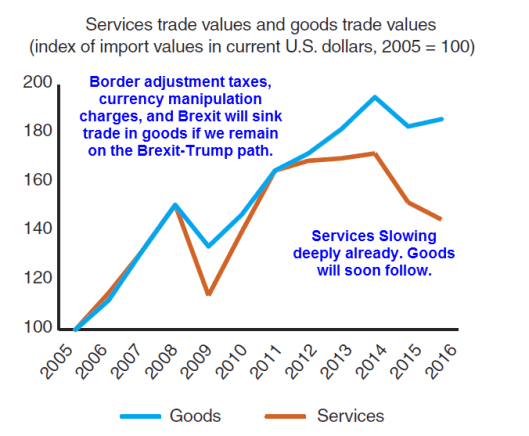 Much of this recovery was predicated on the cost of fuel that went to inflate the cost of shipping, rather than the genuine uptick in global trade. Worse, Suez Canal traffic is still trending down: http://www.hellenicshippingnews.com/suez-canal-revenues-decline-in-wake-of-sluggish-global-trade/, although Panama Canal volumes are hitting new records http://www.tradewindsnews.com/andalso/1213246/panama-canal-volumes-hit-new-record (the data is not adjusted for the capacity expansion since June 2016). 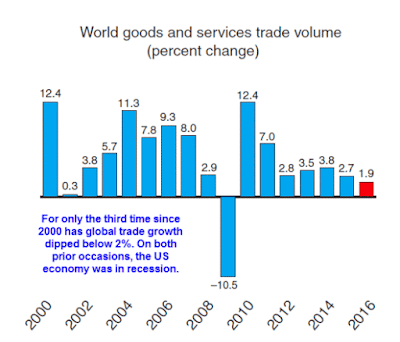 Even with that expansion, Trans-pacific trade is up only 4.3% y/y in 2016, an improvement on 3.7% growth in 2015, but much worse than 5.9% growth in 2014 (see http://www.hellenicshippingnews.com/volume-recovery-in-far-east-europe-and-transpacific-trade/). 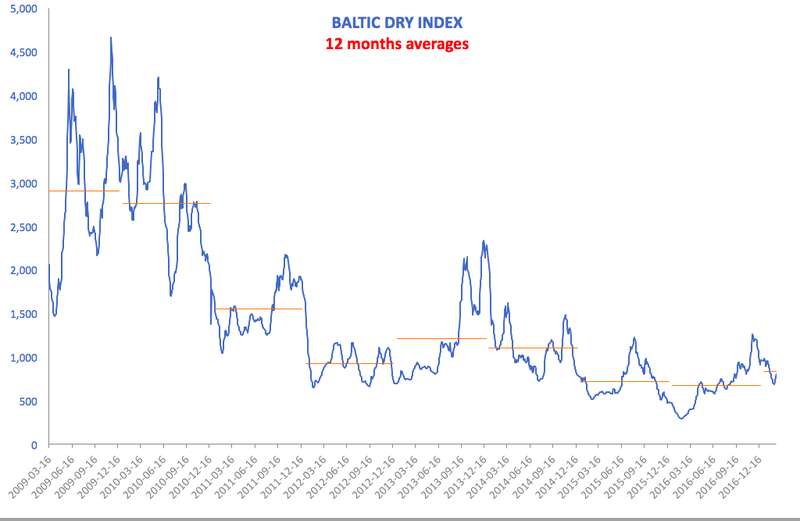 Overall, even the improved Baltic Dry Index current average for 2017-to-date is at around 831.6, which is below all 2009-2014 annual averages. Not exactly a sign of booming global economy. 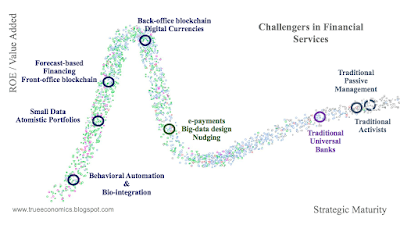 A new research paper from the U.S. Federal Reserve System, titled “Distributed ledger technology in payments, clearing, and settlement” (see citation below) looks at the rapidly evolving landscape of blockchain (distributed ledger technologies, or DLTs) in the financial services. 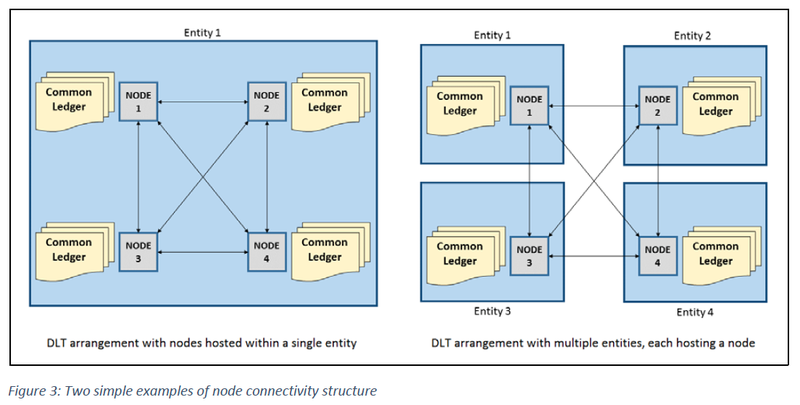 The authors note that DLT “is a term that [as of yet]… does not have a single definition”. 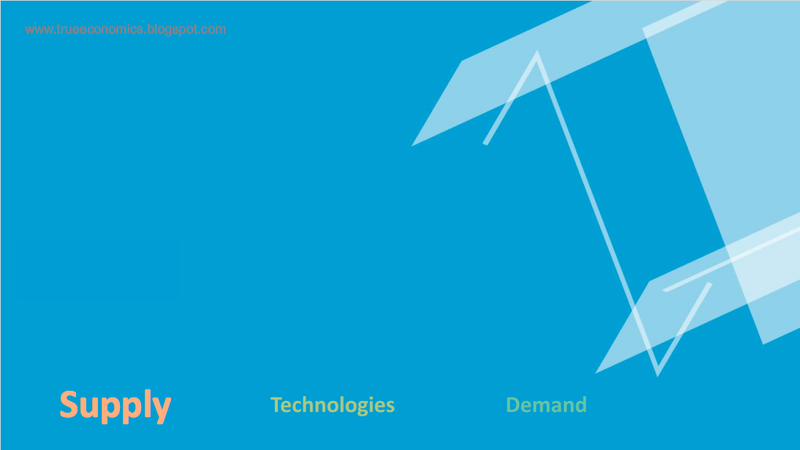 Thus, the authors “refer to the technology as some combination of components including peer-to-peer networking, distributed data storage, and cryptography that, among other things, can potentially change the way in which the storage, record-keeping, and transfer of a digital asset is done.” While this definition is broader than blockchain definition alone, it is dominated by blockchain (private and public) typologies. 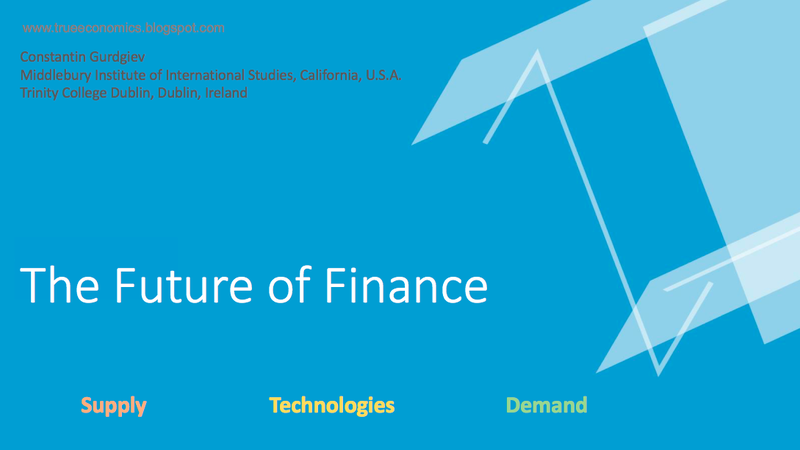 Per authors, the impetus for this research is that DLT is one core form of financial sector innovation “that has been cited as a means of transforming payment, clearing, and settlement (PCS) processes, including how funds are transferred and how securities, commodities, and derivatives are cleared and settled.” Furthermore, “the driving force behind efforts to develop and deploy DLT in payments, clearing, and settlement is an expectation that the technology could reduce or even eliminate operational and financial inefficiencies, or other frictions, that exist for current methods of storing, recording, and transferring digital assets throughout financial markets.” This, indeed, is the main positive proposition arising from blockchain solutions, but it is not a unique one. 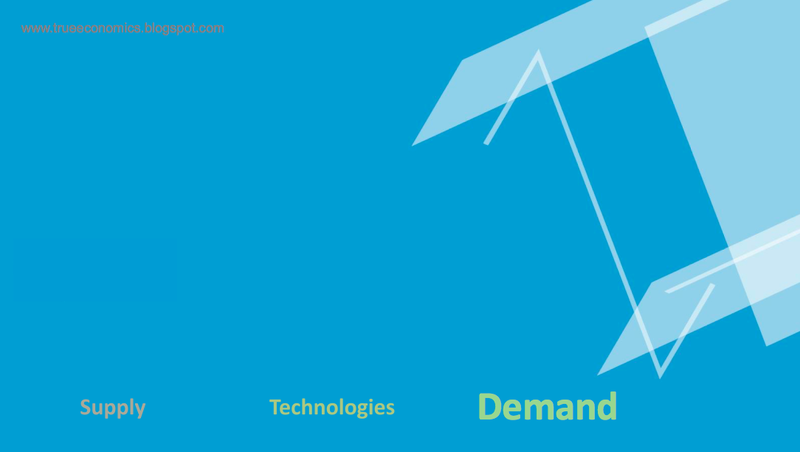 Blockchain systems offer provision of greater security of access and records storage, higher degree of integration of various data sources for the purpose of analytics, greater portability of data. These advantages reach beyond pure efficiency (cost savings) arguments and go to the heart of the idea of financial inclusion - opening up access to financial services for those who are currently unbanked, unserved and undocumented. 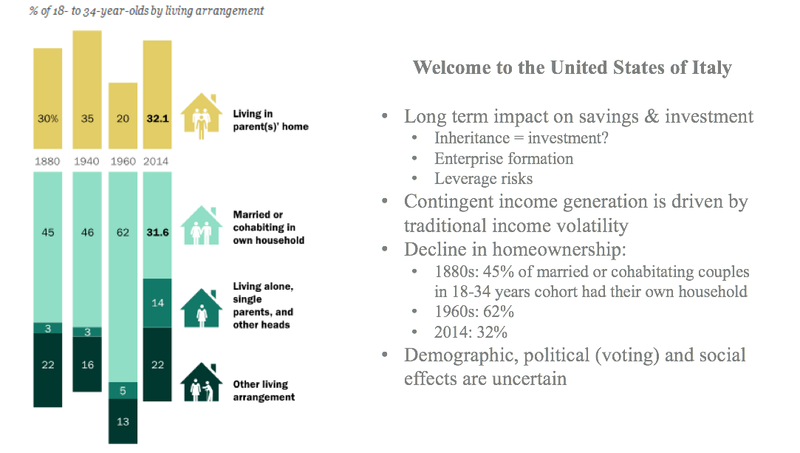 Per Fed research, “U.S. PCS systems process approximately 600 million transactions per day, valued at over $12.6 trillion.” In simple terms, given average transaction cost of ca 2-2.5 percent, the market for PCS support systems is around USD250-310 billion annually in the U.S. alone, implying global markets size of well in excess of USD750 billion. 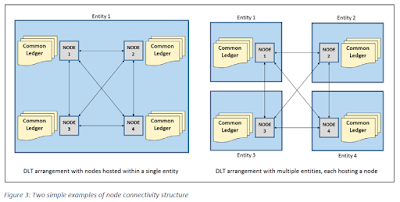 The key to the above is that blockchains ledgers are neutral to the assets that are recorded on them, unlike traditional electronic and physical ledgers that commonly require specific structures for individual types of assets. 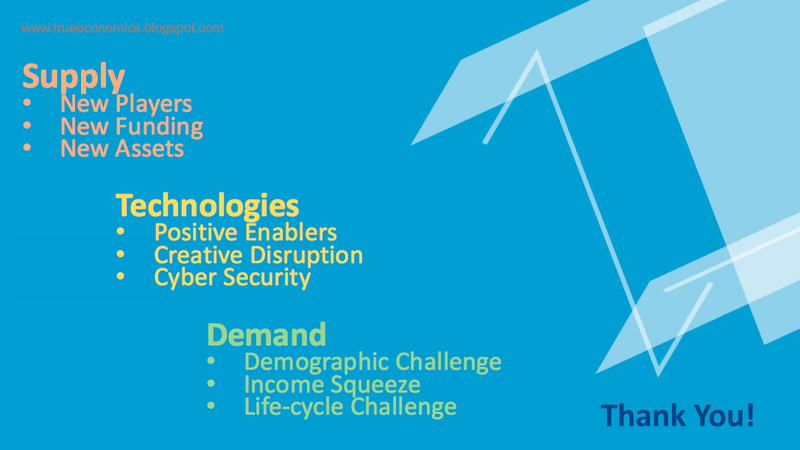 The advantage of the blockchain is not simply in the fact that you can use the ledger to account for transactions involving multiple and diverse assets, but that you can also more seamlessly integrate data relating to different assets into analytics engines. 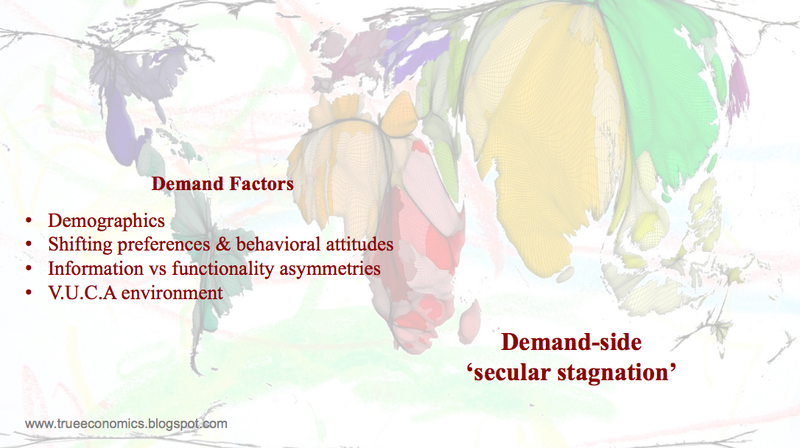 Lower costs are key to achieving financial inclusion because serving lower income (currently unbanked and unserved) customers in diverse geographical, regulatory and institutional settings requires trading on much lower margins than in traditional financial services, usually delivered to higher income clients. Reducing costs is the key to improving margins, making them sustainable enough for financial services providers to enter lower income segments of the markets. 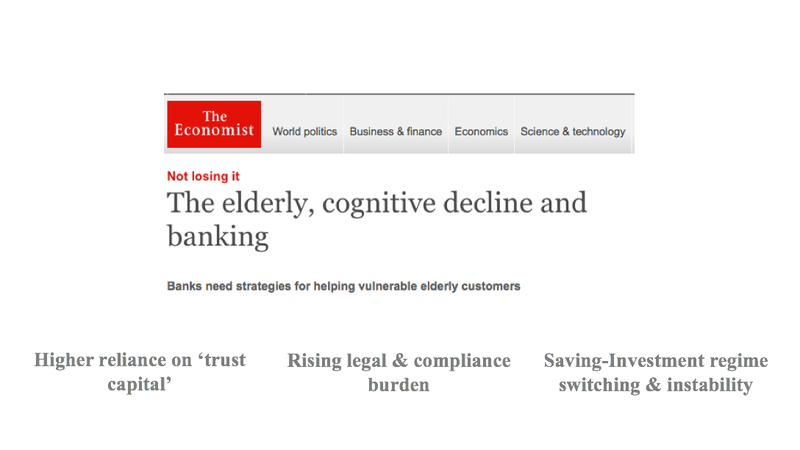 Incidentally, in addition to lower costs, improving financial inclusion also requires higher security and improved identification of customers. These are necessary to achieve significant gains in efficiencies in collection and distribution of payments (e.g. in micro-insurance or micro-finance). Once again, DLT systems hold huge promise here, including in the areas of creating Digital IDs for lower income clients and for undocumented customers, and in creating verifiable and portable financial fingerprints for such clients. 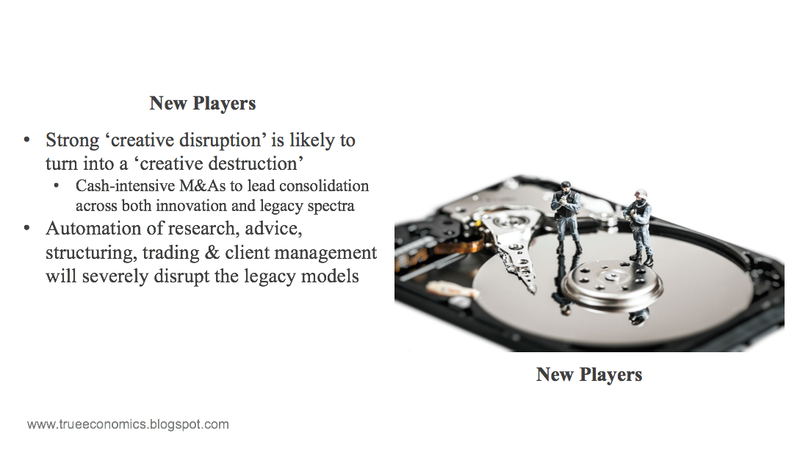 The Fed paper partially touches this when addressing the gains in information sharing arising from DLT platforms. 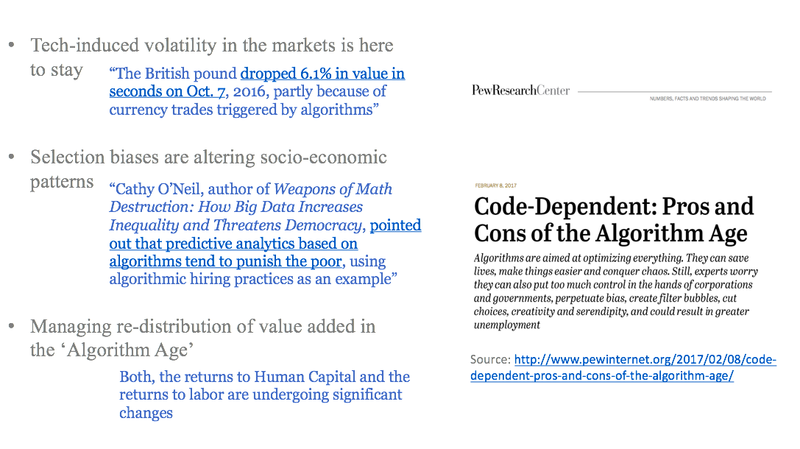 “According to interviews, the ability of DLT to maintain tamper-resistant records can provide new ways to share information across entities such as independent auditors and supervisors.” Note: this reaches well beyond the scope of supervision and audits, and goes directly to the heart of the existent bottlenecks in information sharing and transmission present in the legacy financial systems, although the Fed study omits this consideration. 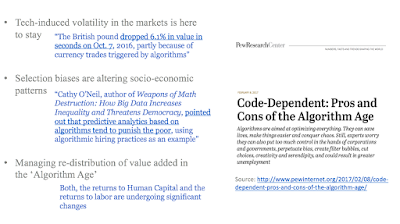 Once again, the Fed research does not see beyond the immediate issues of auditing and supervision. In reality, “read-only” access or “targeted access” can facilitate much easier and less costly underwriting of risks and structuring of contracts, aiding financial inclusion. Overall, the Fed paper “has examined how DLT can be used in the area of payments, clearing and settlement and identifies both the opportunities and challenges facing its long-term implementation and adoption.” This clearly specifies a relatively narrow reach of the study that excludes more business-focused aspects of DLTs potential in facilitating product structuring, asset management, data analytics, product underwriting, contracts structuring and other functionalities of huge importance to the financial services. Secondly, the key obstacles to the DLT deployment are the legacy services providers and systems - an issue that also worth exploring in more details. 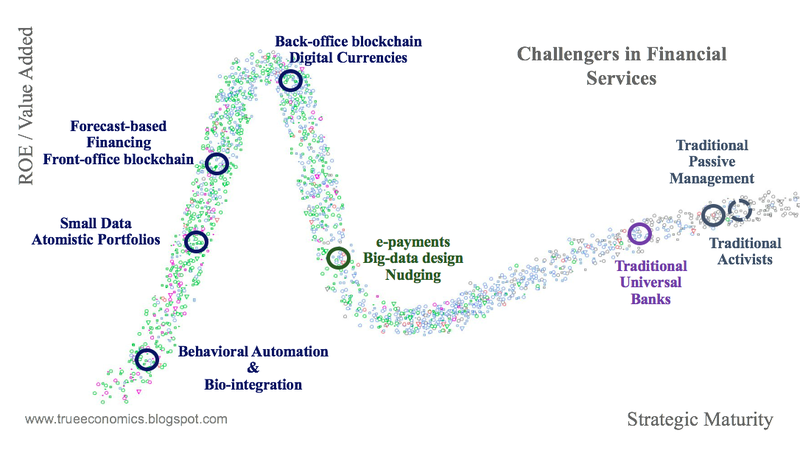 In both, the former and the latter terms, it is heartening to see U.S. regulatory bodies shifting their supervisory and regulatory approaches toward greater openness toward DLT platforms, when contrasted against the legacy financial services platforms. My article for the Cayman Financial Review covering the transition in strategic and systemic risks between 2016 and 2017 is available here: http://www.caymanfinancialreview.com/2017/02/01/the-continuation-of-a-horrible-year/. Euromoney covering the Greek crisis (latest iteration) with a comment from myself: http://www.euromoney.com/Article/3663144/Delays-to-second-bailout-cause-spike-in-Greek-risk.html. 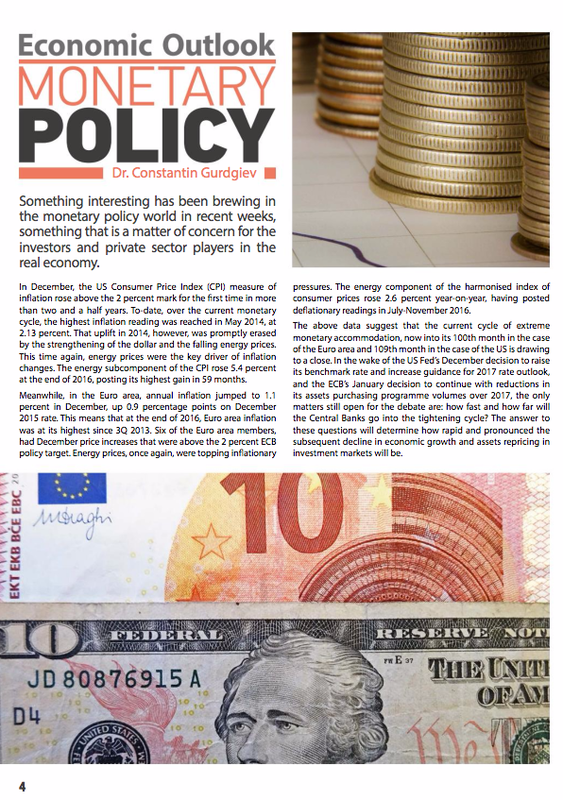 My article for Manning Financial covering monetary policy outlook is out and can be viewed here: https://issuu.com/publicationire/docs/mf_february_2017__1_?e=16572344/44717793. 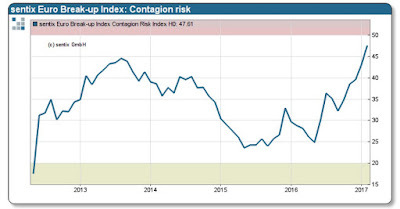 Much has been said recently about the collapse of ‘risk gauges’ in the financial markets, especially on foot of the historically low readings for the markets’ ‘fear index’, VIX. 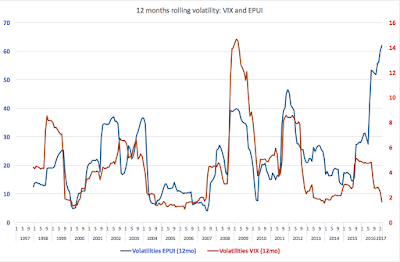 In terms of medium-term averages, current VIX readings are closely matching the readings for the period of ‘peak’ ‘Great Moderation’ of 1Q 2005 - 4Q 2006, while on-trend, VIX is currently running below 2005-2006 troughs. In other words, risk has effectively disappeared from the investors’ (or rather traders and active managers) radars (see chart below). 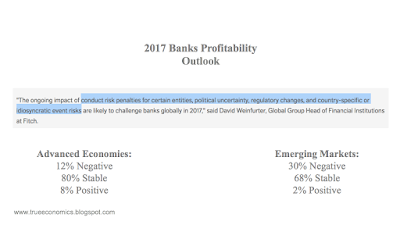 At the same time, traditional perceptions of risk in the financial markets have been replaced by a sky-rocketing uncertainty surrounding the real economy, and especially, economic policies. 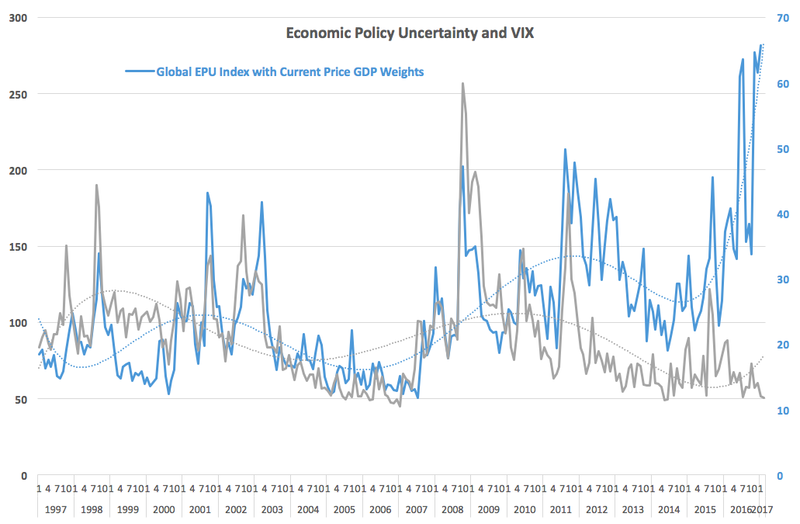 The Economic Policy Uncertainty Indices have been hitting all-time highs globally (see chart below), and across a range of key economies (see this for my recent analysis for Europe: http://trueeconomics.blogspot.com/2017/01/15117-2016-was-year-of-records-breaking.html, this for Russia and the U.S.: http://trueeconomics.blogspot.com/2017/01/17117-russian-economic-policy.html). 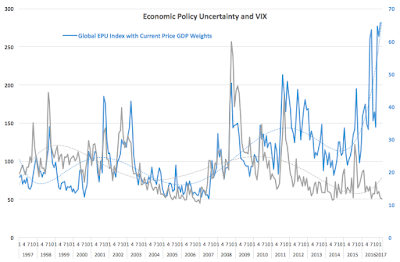 In current data, Economic Policy Uncertainty Index (EPUI) has been showing extreme volatility coupled with extreme valuations. 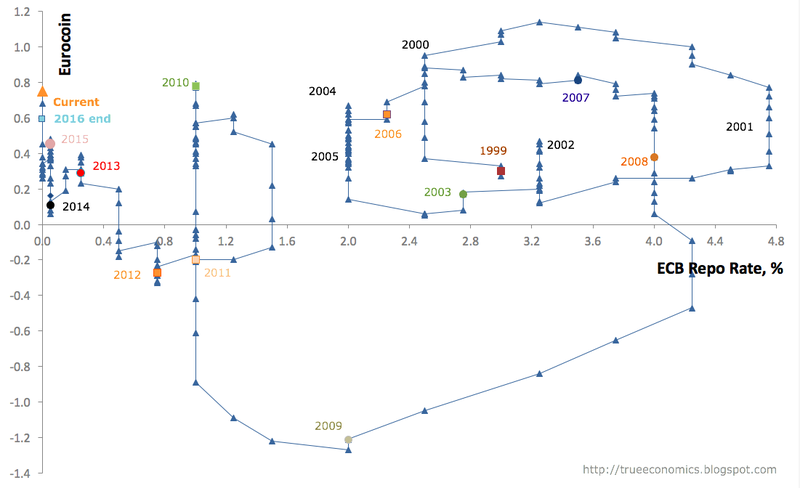 Index values are rising above historical norms both in terms of medium-term averages and in terms of longer term trends. 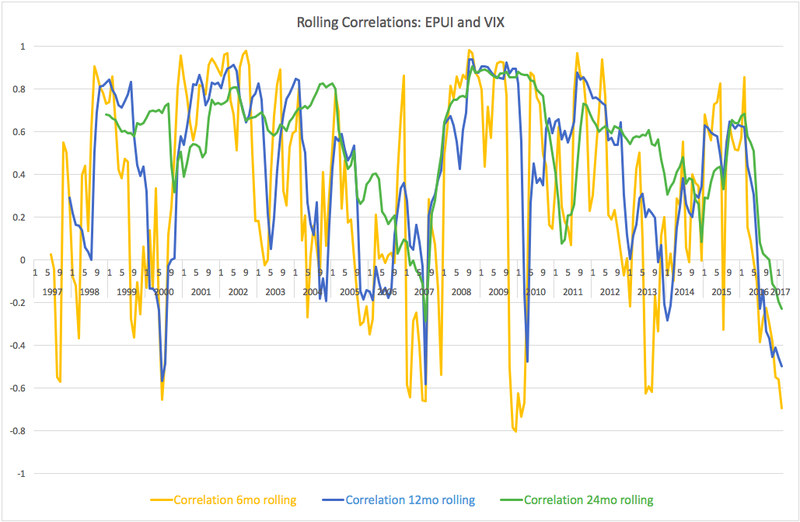 Another interesting feature is the direct relationship between the EPUI and VIX indices. 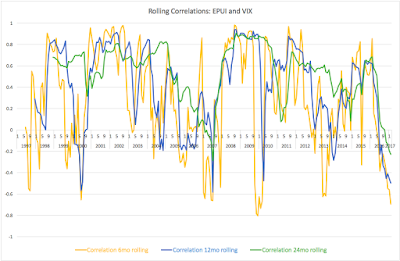 Based on rolling correlations analysis (see chart below), the traditionally positive correlation between the two indices has broken down around the start of 2Q 2016 and since then all three measures of correlation - the 6-months, the 12-months and the 24-months rolling correlations - have trended to the downside, turning negative with the start of 2H 2016. Since November 2016, we have a four months period when all three correlations are in the negative territory, the first time this happened since June 2007 and only the second time this happened in history of both series (since January 1997). 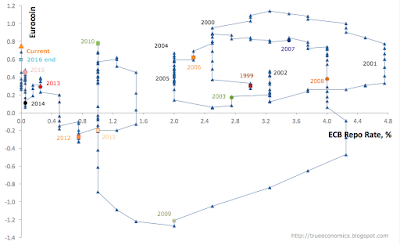 Worse, the previous episode of all three correlations being negative lasted only two months (June and July 2007), while the current episode is already 4 months long. 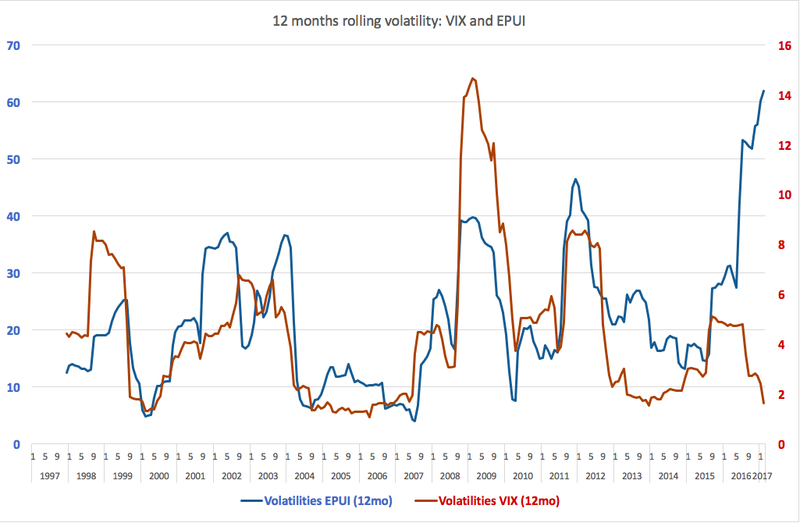 Final point worth making is that while volatility of VIX has collapsed both on trend and in level terms since the start of H1 2016 (see chart below), volatility in EPUI has shot up to historical highs. 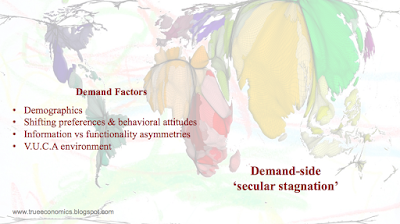 Taken together, the three empirical observations identified above suggest that the current markets and economies are no longer consistent with increased traditional risk environment (environment of measurable and manageable risks), but instead represent VUCA (volatile, uncertain, complex and ambiguous) environment. 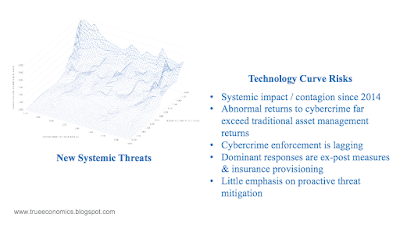 The VUCA environment, by its nature, is characterised by low predictability of risks, with uncertainty and ambiguity driving down efficacy of traditional models for risk assessments and making less valid traditional tools for risk management. 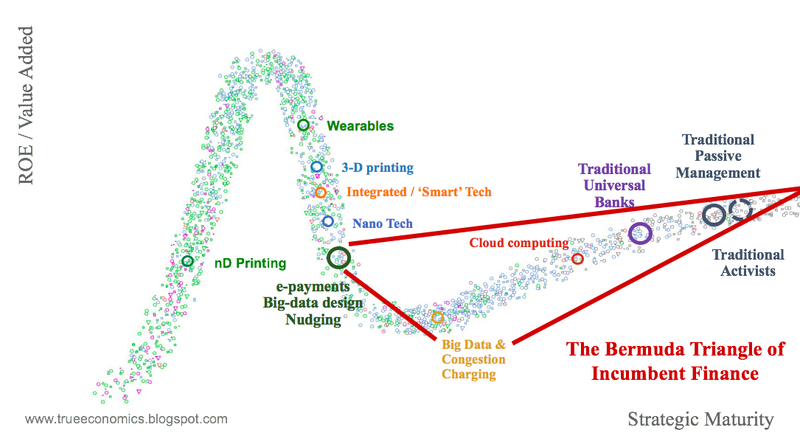 Things are getting increasingly more complex and uncertain, unpredictable and unmanageable. 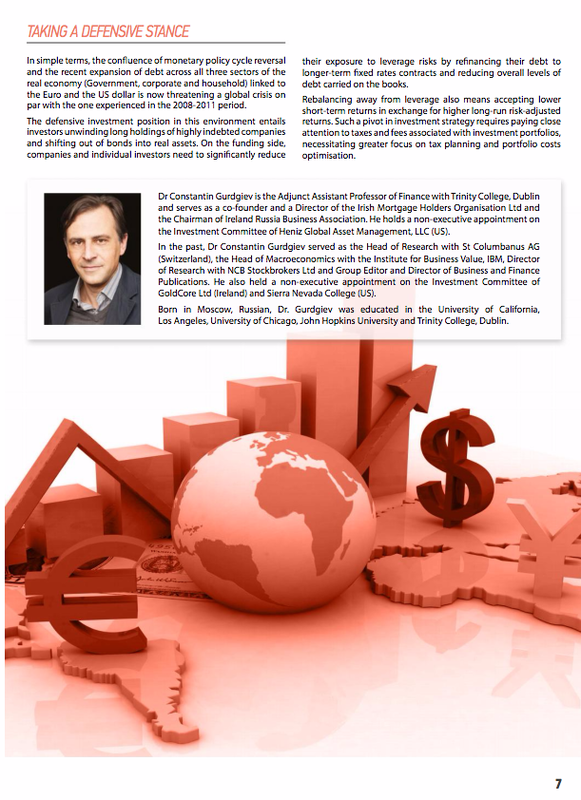 An interesting study from German's CESIfo on the potential impact of a Free Trade Agreement between the EU and the Eurasian Economic Community: http://www.cesifo-group.de/de/ifoHome/publications/docbase/details.html?docId=19267749. 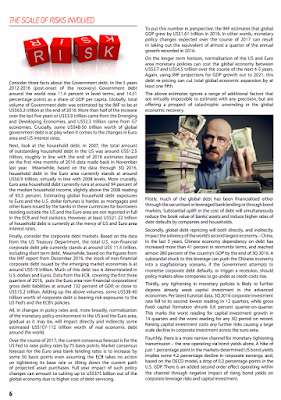 EU side: "According to Ifo’s research results, a comprehensive agreement between the EU and the Eurasian Economic Community could lead to a 0.2 percent increase in real per capita income in the EU, corresponding to an annual EUR 91 upturn in per capita income." Of these, 31 billion euros in benefits are expected to accrue to Germany (net impact for Germany will be 22 billion euros due to increased Russian exports to Germany. Russian side: "For Russia this increase could be as high as three percent or EUR 235 per year. “These income gains stem from the fact that the economic structures on all sides are highly complementary.” Of these some EUR 71 billion is expected to come from increased exports from Russia to the EU states. Additional EUR 6 billion in exports increases will come from rising efficiencies in Russian trade outside the EU. 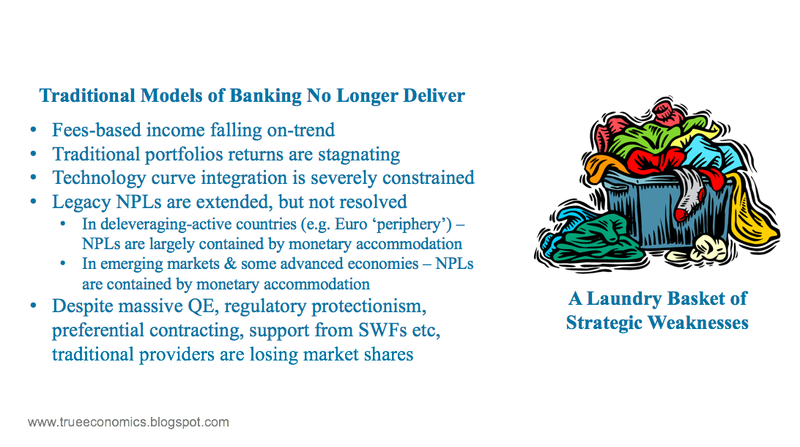 In yesterday’s post I covered some interesting current numbers relating to NPLs in the European banking sector. 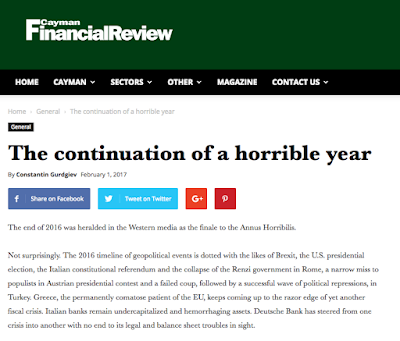 And sitting, subsequently, in the tin can of an airplane on my way back to California, I remembered about this pretty decent paper from Banca d’Italia, published in September 2016. 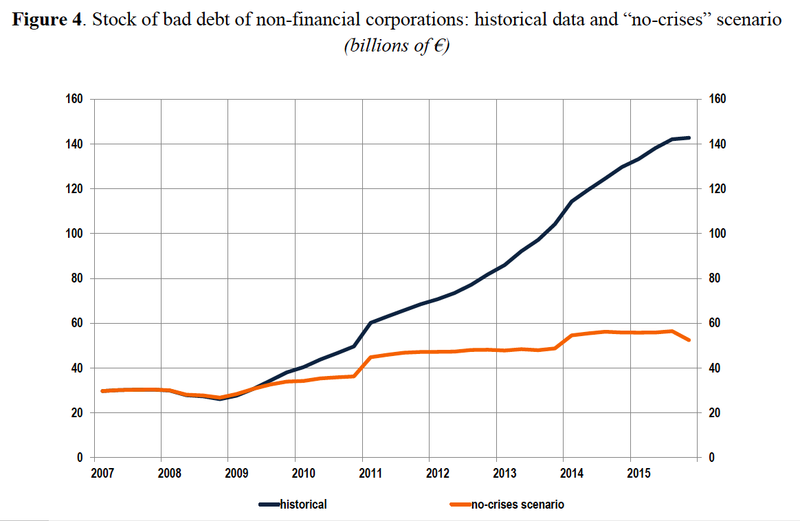 Per authors, “the analysis suggests that, in the absence of the two recessions – and of the economic policy decisions that were taken to combat their effects – non-financial corporations’ bad debts at the end of 2015 would have reached €52 billion, instead of €143 billion." 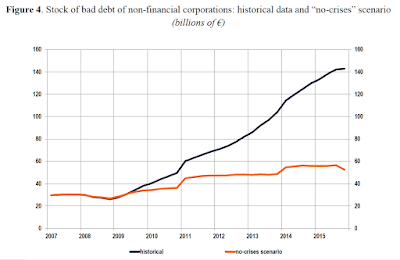 While the numbers may appear to be relatively small, given the size of the Italian real economic debt pile, provisioning on this bad debt overhang would amount to a serious dosh. Per the authors’ and previous estimates, roughly 13 percentage points was lost in Italian GDP (once public debt is accounted for). In other words, through 2015, Italian economy has lost some 13.5 percent of GDP in potential output due to debt overhang. 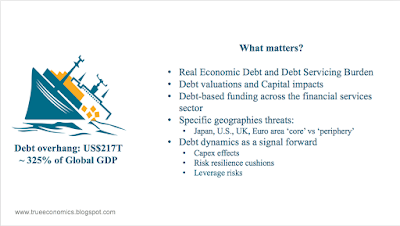 Of this, near 7 percentage points were lost due to sovereign debt-related losses and 6.5 percentage points due to corporate bad debt overhang. 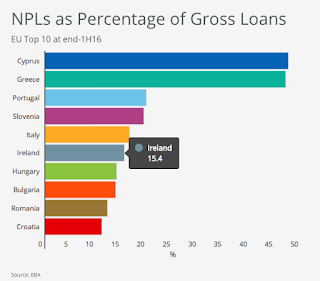 Ireland is compared here to a number of countries where the banks bailouts have either been much shallower or completely absent. Nominal wages have expanded by 12.4 percent, cumulative. 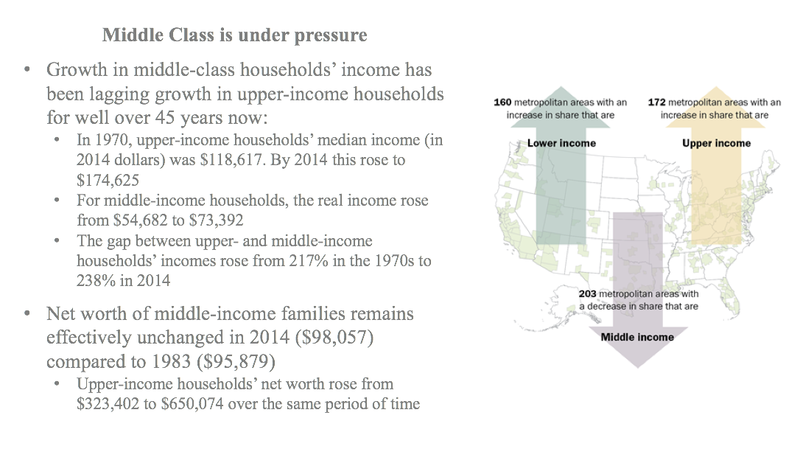 Nominal wages rose 4.64 percent, or less than half the rate of increase in nominal income. Coupled with a simple fact that the EA19 includes countries with consumption and incomes catching up toward the EA12 averages, while gross disposable income does not net out fiscal losses sustained due to post-crisis tax and spending rebalancing across the EA19, the picture is quite dire: there is, effectively, no meaningful growth in incomes in the euro area for some 9-10 years running. Worse, when we adjust for ageing demographics, the marginal increase in the real consumption of the last 9-10 years is also far from being comforting. 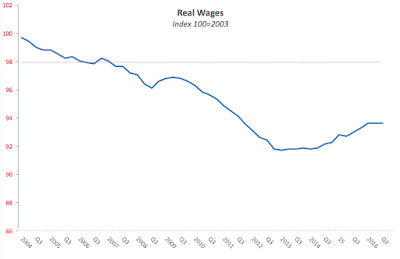 In real (inflation-adjusted) terms, take home (received) wages have fallen in the EA19 group of countries in 2003-2016, with 3Q 2016 real wages index reading at around 93.6, down 6.4 percentage points on the end of 2003. 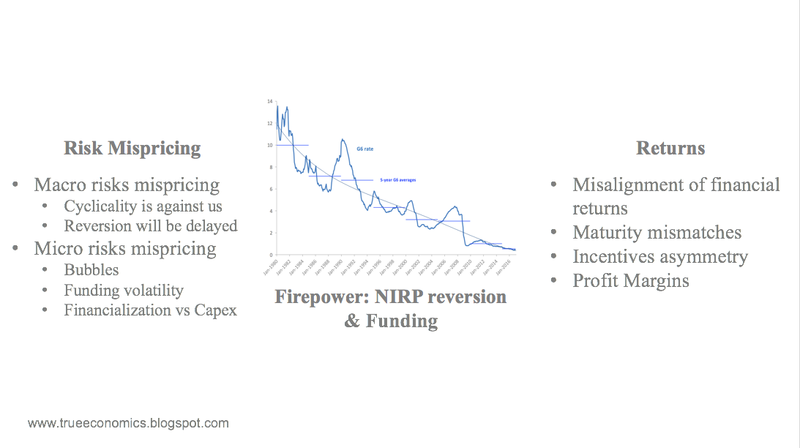 A caveat applying to this is that I am using index values to map out nominal-to-real revaluation. 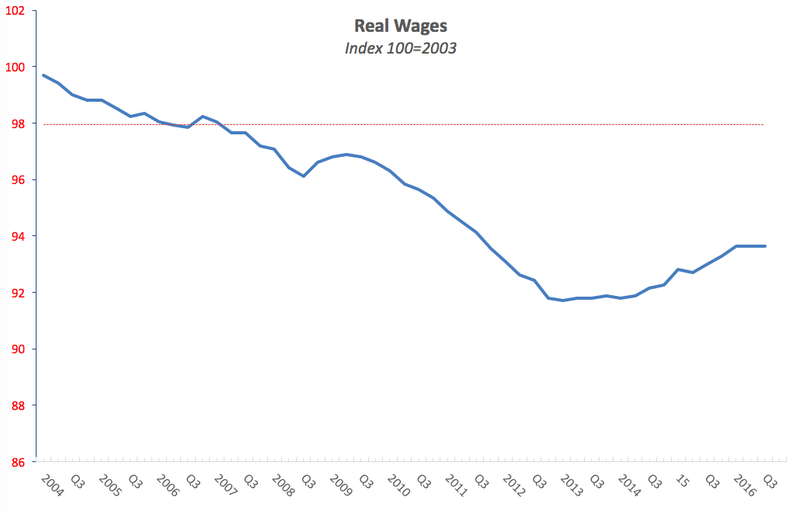 Still, minor errors and rounding issues aside, the chart above clearly shows the lack of real wages income uplift in the EA19 since the early 2000s. 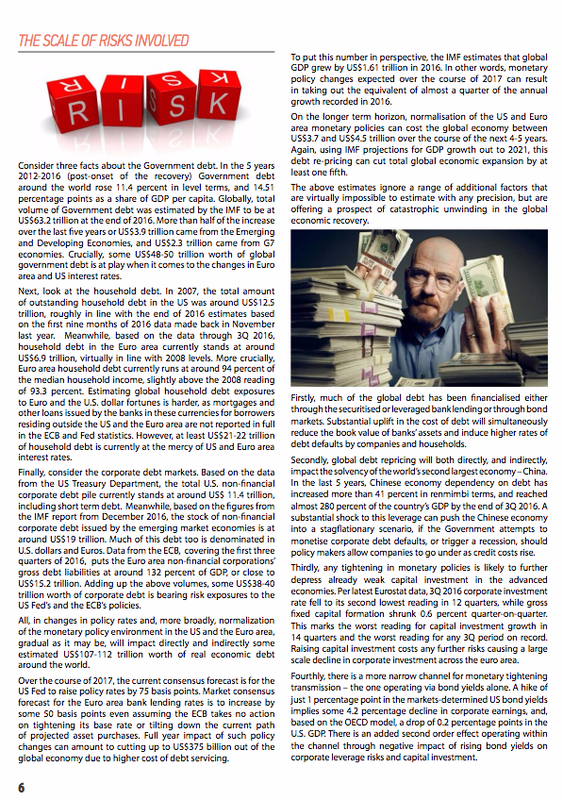 Because global pile of debt growth has been outpacing global economic growth for quite some time now, the sovereign debt bubble is getting wobblier by the day. 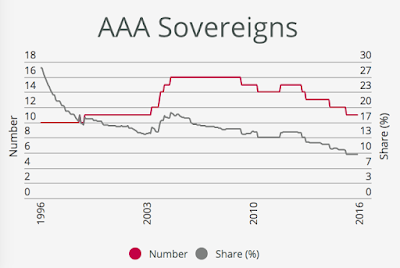 As Fitch Ratings noted yesterday: "The number of Fitch-rated sovereigns with 'AAA' ratings is at its lowest level since 2003 and is expected to remain unchanged over the next two years". In other words, non-junk is getting smaller and smaller, even as Central Banks continue to hold more of the prime stuff. Currently, only eleven countries have 'AAA' status with Fitch, compared with an all-time high of 16 during 2004 to 2009, "reflecting the longer term impact of the global financial crisis." 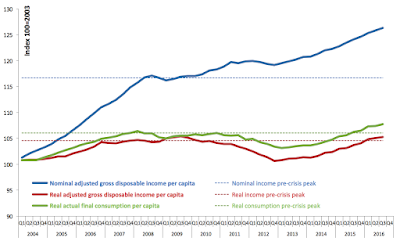 Personally, I don't think this reflects the impact of the GFC alone. 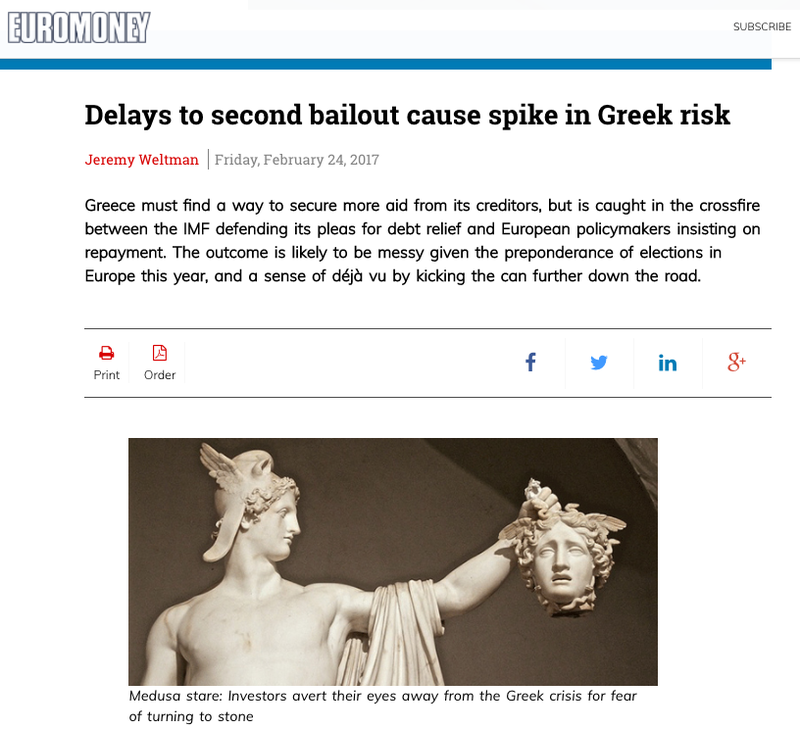 Instead, it reflects the fact that majority of Governments around the world have gone on a debt-piling binge post-GFC in the absence of real productivity and economic growth. 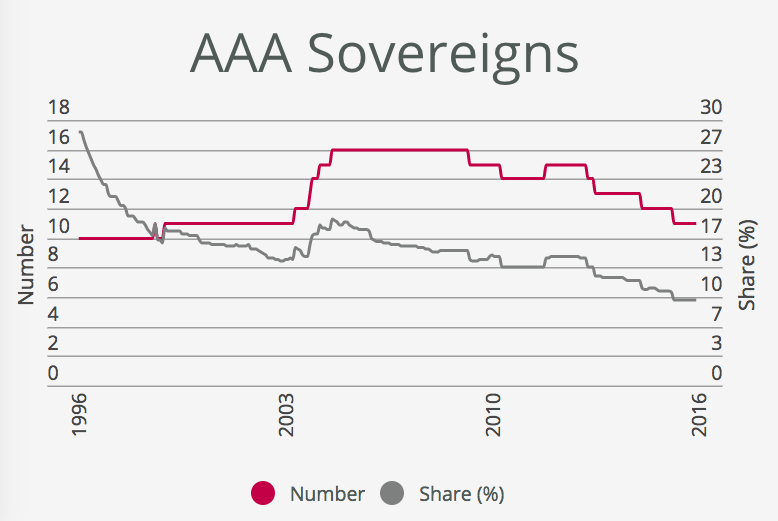 All in, less than 10 percent of the global sovereign debt issuers are now rated AAA. And only 40 percent of global sovereign debt volumes fall under AAA rating (much of this sitting in the Central Banks' vaults), "down from 48% a decade ago". 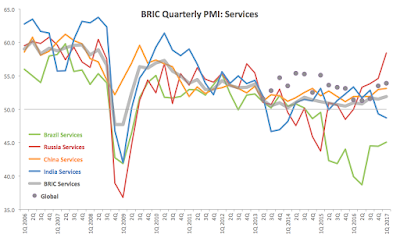 Having covered January PMIs for BRIC economies for manufacturing sector (http://trueeconomics.blogspot.com/2017/02/2217-bric-manufacturing-pmis-russia.html) and for services sector (http://trueeconomics.blogspot.com/2017/02/2217-bric-manufacturing-pmis-russia.html), let’s update data for Composite PMI indicator. 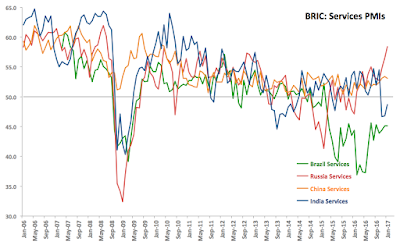 Overall, only one BRIC economy - Russia - provided solid support to global growth in January, with China providing a slight downward momentum and India and Brazil leading to a significant downside momentum. Brazil’s Composite PMI continued to signal severe contraction at 44.7 in January, tanking deeper into a recessionary territory compared to December 2016 reading of 45.2. This makes 23rd consecutive month of contraction. Brazil registered recessionary PMIs in both Services and Manufacturing and in both sectors, January readings were no better than December. 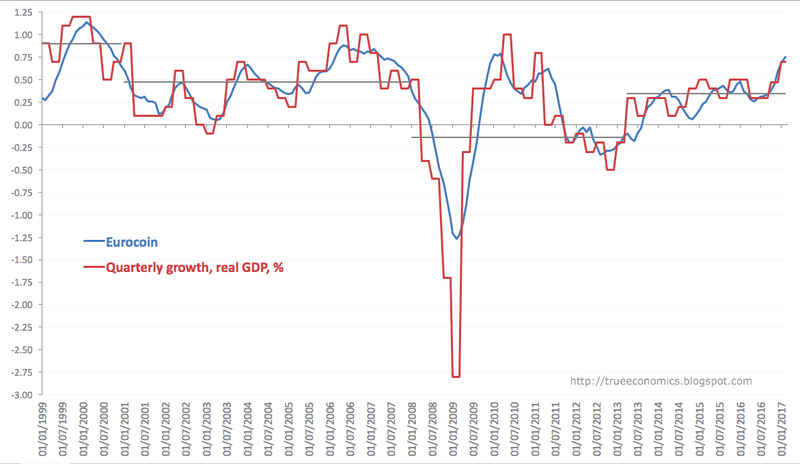 In simple terms, there is no light in the end of Brazil’s recessionary tunnel, yet. Russia Composite PMI posted a robust upward improvement, rising from an already fast-paced 56.6 in December 2016 to 58.3 in January 2017, marking 12th consecutive month of above 50 readings and the highest Composite PMI level on record. Impressively, both Services and Manufacturing sectors PMIs rose in January, compared to December. Chinese Composite PMI posted a significant slowdown in growth from 53.5 in December 2016 to 52.2 in January. Still, the index remains above 50 mark for 11th month in a row. Chinese Manufacturing PMI declined substantially in January, while Services posted a very modest drop. 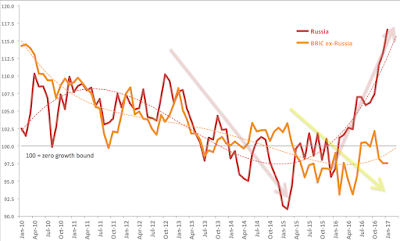 Importantly, Chinese Manufacturing PMI has now dropped below statistically significant above-50 reading, after just one month at the level close enough to being almost statistically significant. 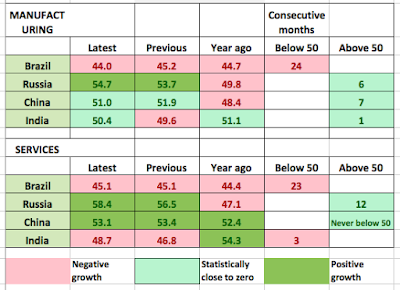 Third month of sub-50 readings in Services PMI and anaemic 50.4 reading in manufacturing meant that India’s Composite PMI remained below 50.0 marker for the third consecutive month, posting 49.4 in January compared to 47.6 in December. 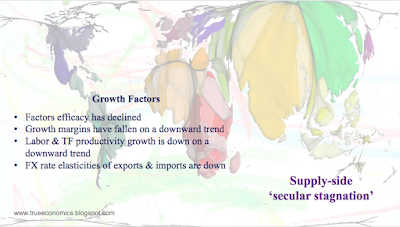 Despite index improvement (signalling slower rate of economic activity contraction), Indian economy remains in recessionary dynamics, courtesy of the completely botched self-inflicted policy mayhem - the misguided demonetisation. 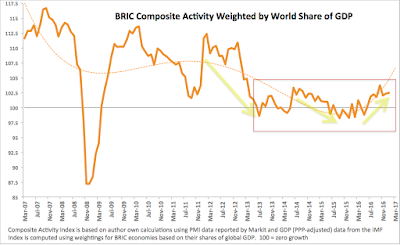 Chart below shows Composite PMIs for BRICs (quarterly basis) against the Global Composite PMI, showing that the current global growth trend is still being supported by the BRICs, with primary positive impact coming from Russian figures. 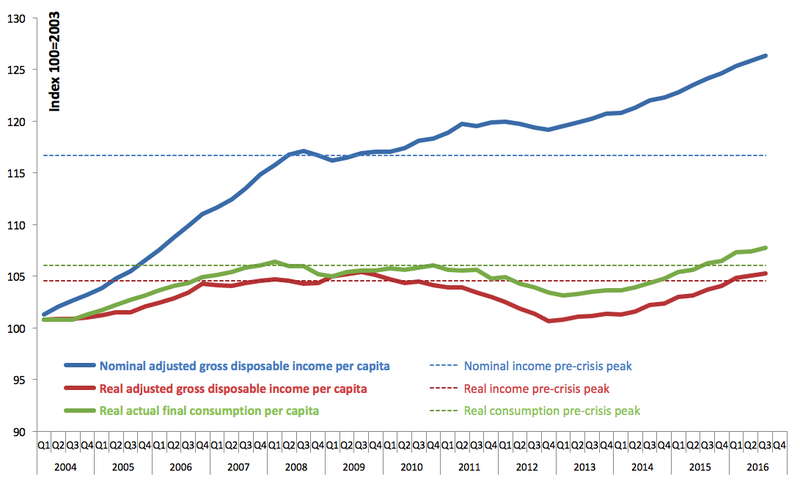 There has been no material improvement in Irish standing in the data in recent years, compared to trends. 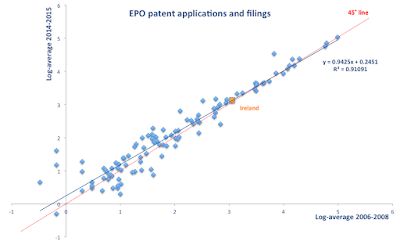 Some of the readers have taken me to task on the second point, despite the fact that my evidence (based on EPO data) shows no gains in Irish patenting activities with the EPO in terms of both applications and filings, and in comparative terms as a share of both in the total number of EPO applications and filings. So I took a different exercise, plotting a relationship between average levels of filings and applications (combined) across 2006-2008 period against the same for 2014-2015 data. 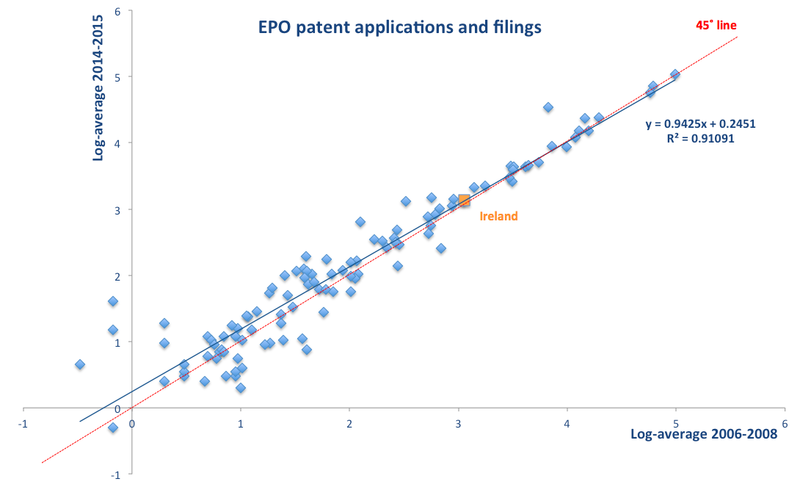 Ireland's patenting performance is to the upper range of the overall distribution of 50 countries, but it is at the bottom of this sub-group of top performing countries. 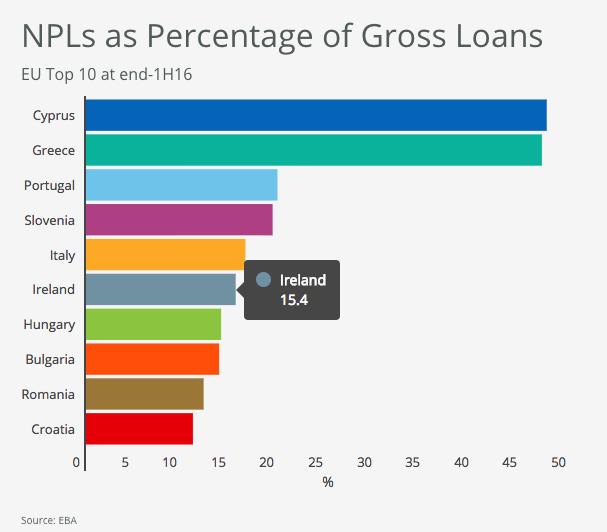 In fact, Ireland's position is statistically indistinguishable from 'mediocre' or 'average' group of countries. Ireland shows only tiny growth in applications between 2006-2008 period into 2014-2015 period (see Ireland's point position just slightly above 45 degree line), which is statistically indifferent from zero growth. Once we control for the factors that drive global trend in patents (blue regression line), Ireland shows no statistically identifiable growth (Ireland's point is bang on the regression line). 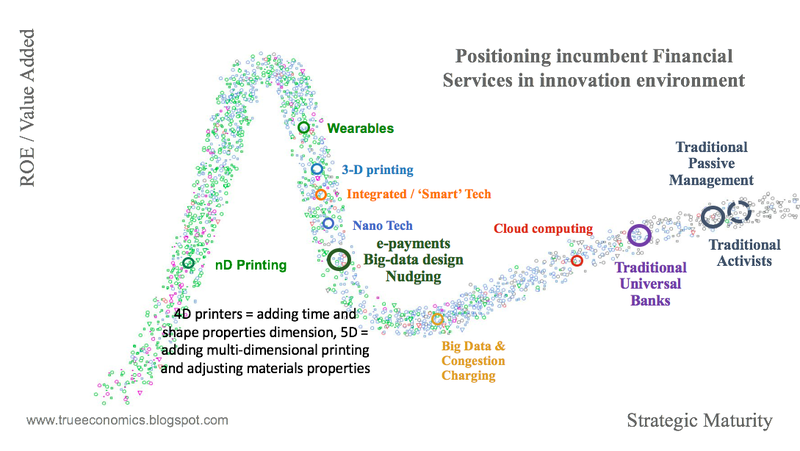 Yes, patents are not the only measure of innovation and R&D, but, being the core part of STEM-focused research, they are the main measure of innovation and R&D, because patents data omits only one form of innovation - that linked to software. Now, software innovation is important, and Ireland may or may not be doing well in this sub-sector, but STEM research is based not on software innovations, but on 'hard' patents. 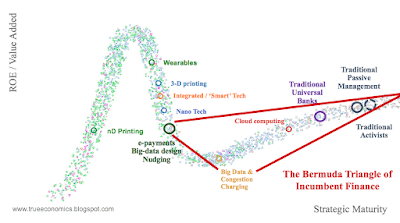 And Ireland does not brand itself as 'Software-only Innovation Hub'. In fact, Ireland spends (as a State and economy) more on STEM innovation than on software innovation, so the key focus on Irish policies is, once again, measurable via patents. 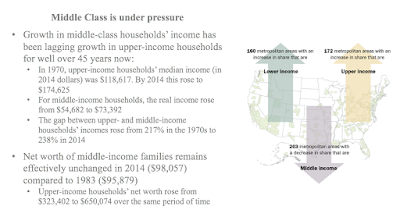 Until we get 2016 data to update the above analysis, I rest this topic discussion. 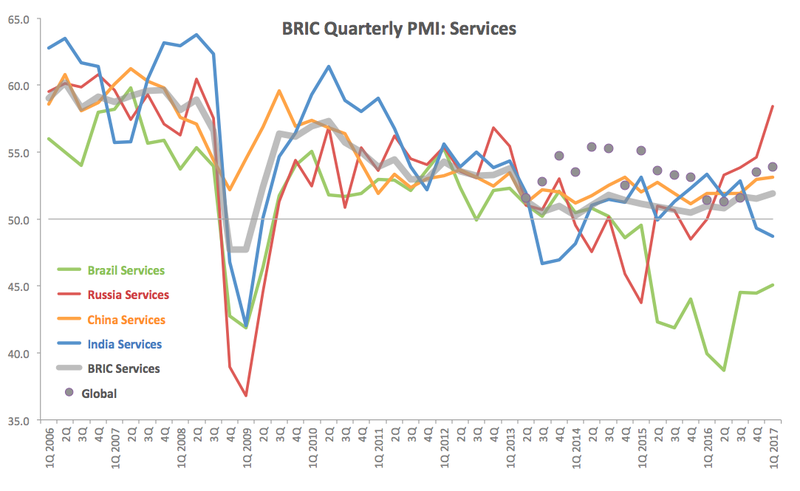 BRIC Services PMIs for January signal continued expansion on world’s largest emerging economies. Brazil Services PMI remained at a disappointing 45.1 in January, same as in December 2016, implying relatively steep rate of economic contraction in the sector. This marks 23rd consecutive month of sub-50 readings for the indicator, almost on par with 24 months-long sub-50 readings run for Manufacturing. Current 3mo moving average for Services PMI is at 44.9, marginally up on 44.0 3mo average for the previous period and on 44.5 3mo average through January 2016. 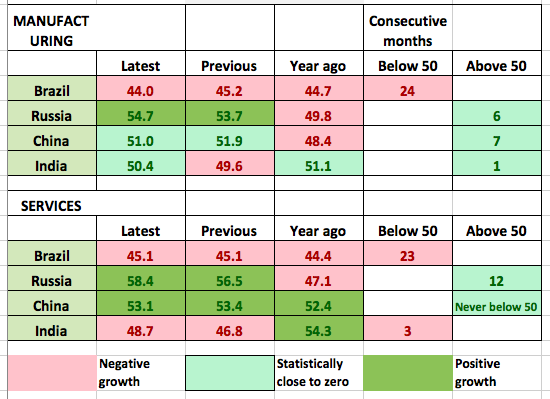 Current 3mo average for Services is in line with the 45.1 3mo average for Manufacturing. Both sectors are signalling continued steep decline in the economy battered by 2 years of recessionary dynamics and no signs of a light at the end of that tunnel. In contrast to Brazil, Russia Services PMI posted another steep acceleration in growth, rising from 56.5 in December 2016 to 58.4 in January 2017, the highest reading in 102 months. As a reminder, Russia’s Manufacturing PMI reached 70-months high in January at 54.7. 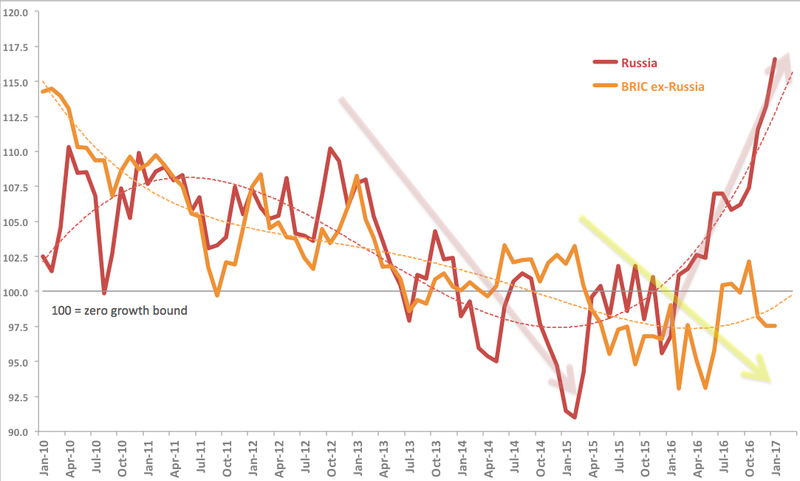 Russian services sector now posted 12 consecutive months of above 50 readings, implying that Russian recession is now over (with Manufacturing PMI reading above 50 for 6 months in a row). 3mo moving average through January is at blistering 56.5, up on already solid 3mo previous at 53.1 and significantly up on 48.2 3mo average through January 2016. Chinese Services PMI posted a slight moderation in growth from 53.4 in December 2016 to 53.1 in January, with current 3mo average at 53.2, up on 52.2 average for the previous 3 months’ period and on 51.3 3mo average through January 2016. 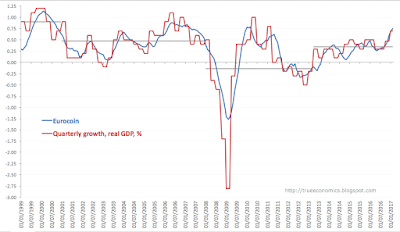 Chinese Services PMI has never registered a sub-50 reading in its history. India Services sector PMI continued to post sub-50 readings for the third month in a row, coming in at 48.7 in January, compared to 46.8 in December. On a 3mo average basis, January reading is at 47.4, which stands in sharp contrast to the sector fortunes in the previous 3 months period (53.7 average) and compared to January 2016 3mo average at 52.7. While the second chart shows current 1Q 2017 performance in quarterly data context. Key point of the above chart is the strong co-movement between Global PMI and the Russian and Chinese PMIs for the sector. 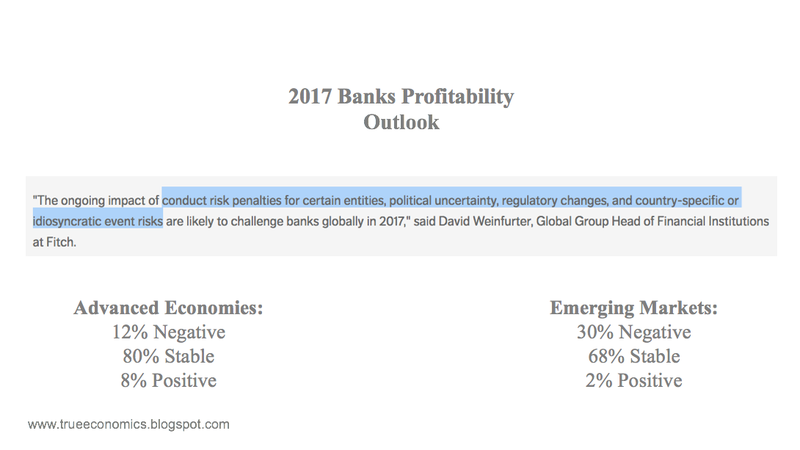 As I noted back in September, this is a strongly positive sign of global economy gaining some much needed growth momentum. 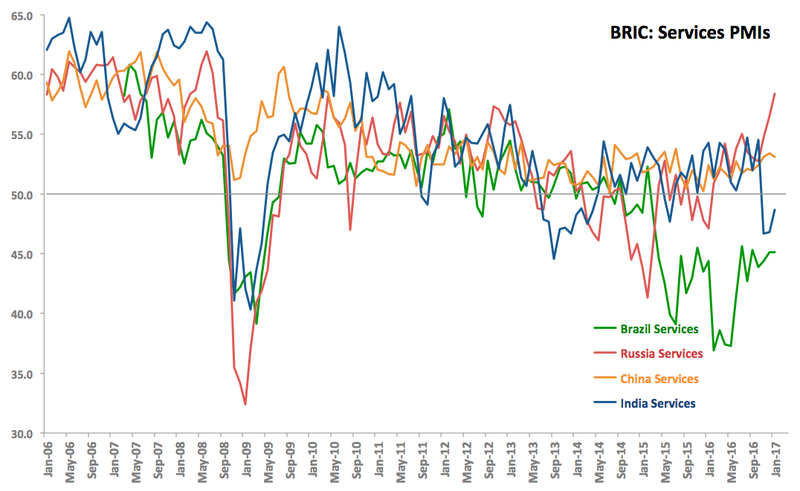 Clearly, Russia leads growth momentum within BRICs, with China providing supporting uplift. India and Brazil act as major drags on global growth across the Services sector. 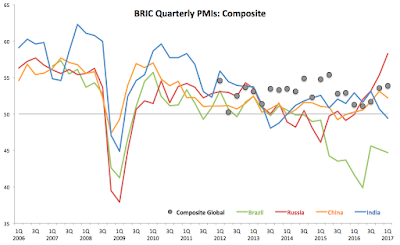 Note: I covered BRIC Manufacturing PMIs in an earlier post here: http://trueeconomics.blogspot.com/2017/02/2217-bric-manufacturing-pmis-russia.html.